LS2-Edit will let you tune many of the latest 2005-2015 cars and trucks. We started tuning all the Corvette engine ECM's, and now support a huge range of Gen IV cars and trucks, including the 7.0L, 6.2L, 6.0L, 5.3L, 4.8L, 4.6L, 4.4L, 3.9L, 3.6L engines and many of the 3.7L, 3.5L, 3.4L, 2.9L, 2.4L, 2.2L, and 2.0L engines. To see the specific cars/trucks and engines supported, please check the list below. We now have a beta version of a diagnostic scanner for all 'LS2' engines, for use with our LS2-edit cabling. Please drop us a line (send email to pcmdoc@surfree.com) if you would like to try it out! LS2-edit will tune the listed ECM's, and will tune their TCM's. We are currently shipping both the unlimited-E/TCM version and the ECM/TCM-locked version of LS2-edit for 2005 - 2012 cars and trucks. Upon receipt of fully paid orders, we ship within 2 business days. Interested in ordering the unlimited-E/TCM version of LS2-edit? Here is pricing: LS2 Unlimited Order Form. With your laptop, LS2-edit provides everything you need to tune your car. Our package includes the interface cable for your vehicle, the Cable Interface Module, the USB cable to your laptop, and the software to read, program, and edit your ECM and your TCM on your laptop. Mailing via air is even included (to U.S. locations, shipping outside the U.S. is extra). LS2-edit runs on Windows 98 (Second Edition), Windows NT, Windows XP, Windows Vista and Windows 7 operating systems. Minimum hardware requirements are a 400 MHz Pentium or AMD processor with at least 128MB RAM. You will also need one available USB port on the PC. This is used for the vehicle interface module we provide. 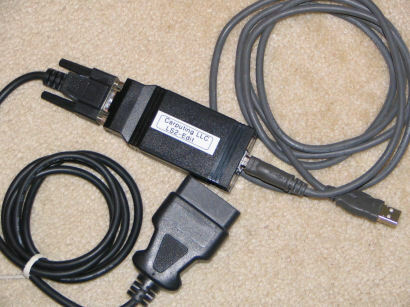 One word of caution: if you want to add additional E/TCM's for LS2's at a later date, you will need to return the Cable Interface Module to us for updating. The E/TCM-locked version of LS2-edit can license between 1 and 4 ECM's. After 4 licenses, you will need to purchase an additional LS2-edit package. A word of warning: Please only program your E/TCM using an LS2 file that was read from your specific E/TCM. Do not try to program your E/TCM with an LS2 file from a different E/TCM. To minimize programming time, we do not completely reprogram the E/TCM, only the data segments. If you use a different LS2 file, the data in the LS2 file may not match the code already stored in the E/TCM. If you attempt this, you may end up with a E/TCM that is non-operational.